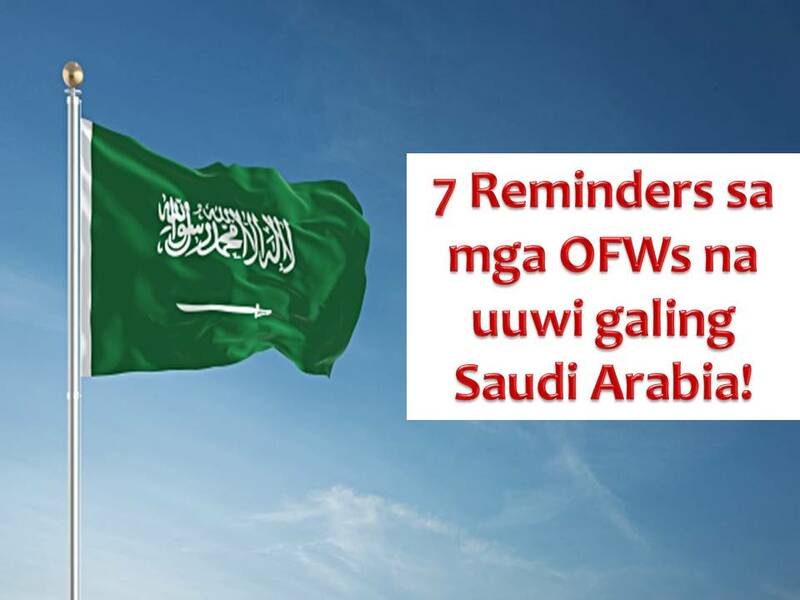 After working for how many years, maybe, just maybe, some of our OFWs in Saudi Arabia finally want to retire and go home, there are some who are planning to go home for good. But before going home, read this seven frequently asked questions first and be your guide so that you can say, you can go home without hassle and problem of leaving the country. 1. What are the three things that OFW must possess in order for him to return home? Philippine Passport (still valid for six months before its expiration date) or Travel Document in the absence of a passport. Exit Visas are given once the worker obtains a No Objection Certificate (NOC) from his sponsor and all the fees have been paid. Here's a warning. If you are an OFW and have unresolved criminal records in Saudi Arabia, sad to say, you cannot go home. Just clean your mess first. 2. Is there amnesty program for illegal workers in Saudi Arabia? Saudi authorities are still in the process of studying the amnesty program for migrant workers. 3. An OFW absconds his/her employer or sponsor. What are the things he/she needs to do to come home? Workers who absconded from their employer violates Saudi Labor Law. It is the duty of the sponsor/employer to inform the Saudi General Directorate for Passports (Jawazat) within 24 hours of their worker leaving. Absconding has a penalty of six months imprisonment, a fine of SAR 2,000.00, and deportation. Aside from this, a fine will be imposed against the worker for lost or expired iqama or residence ID. This is the public rights aspect of the case. The private rights aspect meanwhile pertains to the penalties that must be paid to the employers if the workers failed to finish their contracts or if the employer filed a case against the OFW. This is the reason why an OFW must first get the consent of his sponsor/employer, stating that the latter is not objecting to his desire to come home. 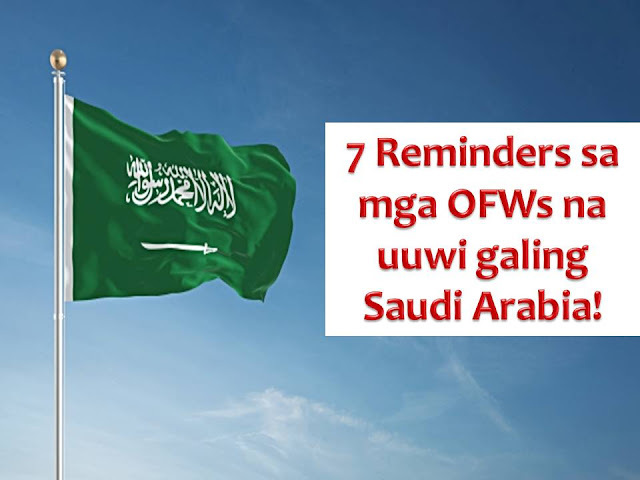 OFWs are also advised to get in touch with their employers to get an NOC and together, proceed directly to the Saudi General Directorate for Passports to pay the necessary fees and arrange for their travel home. OFWs, must at all times, provide accurate and truthful information to be assisted. 4. What are the documents needed in order for the embassy to assist the repatriation of an OFW who ran away from his/her sponsor? 5. What are the common reasons why some OFWs having the difficulty of coming home in spite of having NOC from their employers? 6. How about undocumented children of OFWs? If there are no records from the hospital, a sworn statement of two disinterested persons may be executed. Forms may be obtained from the Consular Section of the embassy in Riyadh. These are needed to process the Travel Document the child. However, this is not a guarantee that the child will soon be repatriated, especially if the parents are not married. Under Saudi Law, there is a corresponding penalty imposed on parents who have children out of wedlock. 7. Can a worker from Riyadh or other provinces process his papers in Jeddah? A worker must process his exit papers from their area. Once he obtains an NOC, he will need to get in touch with the Saudi General Directorate for Passports to pay fees and get his exit visa. Yes, we all know that you are excited about coming back to the Philippines, but nothing beats the feeling that you are free from any obligation of the host country where you work for how many years or even decades.